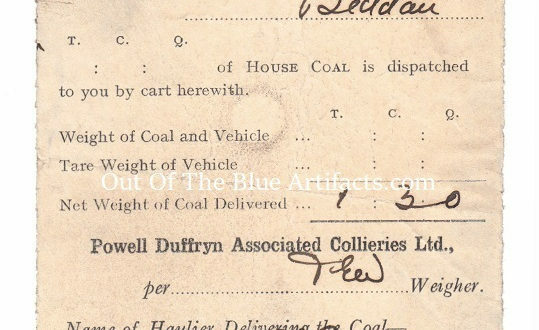 Powell Duffryn Associated Collieries Ltd – House Coal Consignment Note. This was a House Coal Consignment Note. From Cwm Colliery Beddau. House Coal was allocated to all Miners on condition that the Miner had to be a householder or the oldest person in the household that worked in the colliery. Only one person per household who reached these requirements would receive the allowance, if for example there were 3 family members in one household that worked in the pit only the eldest person would receive it, the other members would have to forfeit their right for a consignment. If a Miner receiving the allowance died, his wife would be entitled to the allowance upon her retirement age on condition she never remarried. he coal consigned had to be used by the Miner for domestic use only and not sold on to a third party. Anyone who misused their allocations would be penalised by having their household consignments stopped. The amount allocated was 1 ton and there were normally on average 4 to 5 allocations per year. If the Miner retired whilst in the employ of the Coal Company the House Coal consignments were still allocated though the amounts received would be lowered to about 4 tons per year. Notes of Interest – Private Coal Merchants were often used to convey the House Coal to the Miners home and carry the consignment of 1 ton, in 20 coal sacks to the coal shed or cot, if the Miner lived mid-terrace or had no accessible back entrance the Coal Merchants would have to carry the coal through the house or even dump it in the road outside the home. The newly built houses at Bottom Areal View, Roseheyworth, Abertillery had the coal shed inside the house, accessed by a door at the bottom of the stairs with the loading hatch on the outside wall by the front door. The Miner was always informed in advance when the consignments of coal was due to be delivered, many occasions there would be no-one home which gave any unscrupulous Coal Merchant a chance to withhold a bag or two and sell it on later in the day. In this instance there were many complaints that the delivery wasn’t the right amount or weight, this caused much distrust between the Householder and Coal Merchant. This underhanded activity by the Coal Merchants went unchecked as it was so difficult to prove, if there was any coal in the shed from the last consignment the new delivery could not be re-weighed or re-bagged to see that the wrong amount was delivered. The Householder caught on to this malpractice and at the time of delivery would try and arrange to have someone at home to count the bags coming from the lorry. I personally know of one family member who at the time of delivery used to put a painted false head on the bedroom windowsill peeping through the net curtains, when he came home from work he found the coal shed would be full of coal. In the 1970s Natural Gas was taking over and if a Miner had no option other than to live in a house that was powered by Gas he was entitled to a “Gas Allowance in lieu of Coal”. This Gas Allowance was normally about £40.00 per month from the N.C.B. to cover the energy costs. The Gas Allowance didn’t last long, it was deemed unfair and illogical as to why the N.C.B., would want to pay the Gas Board money to keep their collieries employees warm when they could supply them with free coal. In 1983 all householders employed by the N.C.B., in a Gas house were given notice to either convert their energy supply to Coal, or if a Council tenant, ask for a transfer to a Coal House. Those who converted or moved were transferred to the Coal Allowance scheme. In the mid to late 1980s the South Wales Collieries closed, all men under the age of retirement lost their Coal Allowance, those of retirement age or those who had already retired and was getting the Coal Allowance could still receive their House Coal and the N.C.B. honoured their consignments to those entitled.